Today is election day. Across the country low turnout is expected. Myriad voices proclaim that there will be a swing to the right. Just as many say that things may stay the same. Where I live the election involves many local propositions and a 15 person slate running to be the mayor of our city. The two items are intertwined. We do ranked-choice voting, so get to vote for 3, and our votes will be counted according to which of our individual choices remain in the contest. It’s seems more like some sort of gambling event than an exercise of democracy. 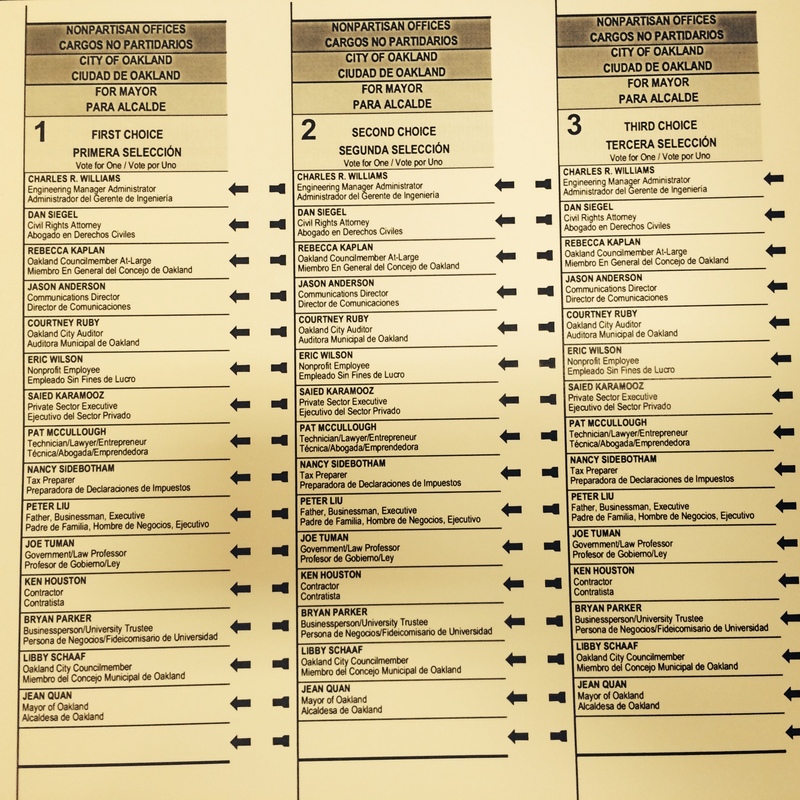 Of course I think real ranked-choice voting would be allocating each of us 15 slots for ranking the 15 candidates. Have you voted? Who are you voting for? I voted early, with a clear focus, after countless weeks of fleeting clarity. What became really clear at the end, at least for me, is in fact the reality that I see each day. Oakland is a city, made up of many lands, or fiefdoms. Today our city, or Town as in contrast to San Francisco’s City is now the “most exciting city in America“: hipster central, a mecca for art, techie and foodie-friendly people, trends and businesses. The birth pangs of gentrification have moved past braxton-hicks like symptoms, to true labor pains. Rents are exploding. Some demographic places in the city are shifting and radically changing (think of West Oakland). Yet Oakland has been known from the beginning as a port town, an economy of shipping: we’re the fifth busiest shipping port in the country. We’re known for violent crime, a perfect mediterranean sunny balanced climate, efforts to be sustainable with resources, a police department threatened with takeover by the Feds, and a flailing school district previously taken over by the state. Much of our civic population first arrived in the past century from the deep South, responding to the need for work in the shipyards and factories that once permeated our waterfront. We have an amazingly diverse population, one of the most ethnically diverse in the nation, ranking 3rd and 4th in studies. Oakland falls just after San Francisco and Seattle in terms of density of civic LGBT populations. There are numerous ethnic-flavored neighborhoods from the section of Ethiopian restaurants in the north to the Vietnamese concentration of businesses in the San Antonio. We describe our town as divided between the Fats and the Flats…with Lake Merritt seemingly straddling the difference. There are elite zip codes within our 946-universe that rank among the most privileged in the country. Simultaneously we have ghettos, food deserts and poverty inundated section of the city, of which 18% of the population live in poverty. Those areas are consumed by issues of food scarcity, health problems, inadequate resources and educational iniquity. Yet most citizens love Oakland and leave (if they do) reluctantly because of prices, educational opportunities, fear of crime, a deserve to create a different future for children and grandchildren. Is it any surprise then that I think we live in more of a collection of fiefdoms than a city? Maybe we should call in Oaklands. I live in East Oakland, yet work in North Oakland. My days are spent spread across the neighborhoods criss-crossing between 880 and 13 like some sort of God’s Eye woven around 580. And so we have a range of mayoral candidates who all claim to be outsiders, even the incumbent and current city council members. They each come from a fiefdom, or one of the Oaklands we call home: the wealth and relative age of the hills, or the toughness of the flats. The entrepreneurial wisdom of the business population or the savoir-faire of our highly educated locale. We are labeled San Francisco Refugees or Old School Oaklanders. We identify with sub-populations gathered around identities stemming from ethnicity, culture and orientation. We struggle in reaction to crime, the challenges facing our public schools and Police Department, what we perceive as injustice because of poverty or wealth, or lack of opportunity or our privilege. No one candidate can do it all, nor respond with cultural competency to our diversity. And yet they need to. We are a united, yet divided city. You can see it in the volatile and vitriolic conversations that erupt on neighborhood yahoo groups, the complaints of one hill school that they were be required to help so many disadvantaged kids from the flatlands, and closed flatland schools that felt cheated by the upper educational echelons. It’s present in the traffic patterns across our streets, and the current flow of trash and debris which stagnantly moves along certain principal corridors. It can be heard when you talk about Occupy and the unresolved suspicions and despair that quickly surface. I’m far from hopeless. I think some great days are here and in store for Oakland. And we do have paramount issues that we must face, towards which a mayor must lead us. These includes projects already in the pipeline like the Coliseum City and the Ceasefire Project. But there also are times we’re not discussing: effects of gentrification, changing our demographics, and the trend that we’ve been closing schools and now our population is growing indicating that we might need to reopen them in the near future. And if we reopen them, they’ll need to be quite different than the schools there were when they closed. We have limited public transportation, which seems to be increasingly centered around areas of trendiness, wealth and/or privilege. Our worship communities have largely been centered around huge active African-American congregations. But their children and grand-children soon will not be able to afford to live here. What will that shift do to our civic makeup? And affordable housing in general? We have some, but if we’re not wise we’re going to end up being another San Francisco which is losing its character and color (in my opinion) because of astronomical housing prices. Maybe we should elect a couple of the candidates, and require them to work together? Whoever wins will need to know how to work with others, delegate while not losing sight of key issues, and be giving shape to the Oakland that is already emerging, not simply maintaining or regretting one of the multiple Oaklands we have known. It’s a gamble. We are betting on which horse we think will best run the race to come. And whoever he or she is needs to run not to win, but run so that we all can win.